Abstract: This meetup will tell the story about how a crazy idea rapidly evolves and what we learned from it. It is about bitcoins. A data scientist and a software nerd joined forces in a bold quest to come up with an algorithm to predict the bitcoin market. The reasoning was simple and somewhat naive: ”we are likely to fail, but at least we learned all the cool stuff”. During this talk the Data Scientist will elaborate on the sentiment analysis in Tensorflow. Did they succeed? Well, come and see this talk! I will use deep learning methods in Tensorflow. In our talk I present the different aspects of a RNN for sentiment analysis such as LSTM units and the Word2Vec model. The mathematical aspects of a LSTM unit are highlighted and explained with easy examples. Besides I will show the very compact and easy Tensorflow code demonstrated in a Jupyter Notebook compared to the complex mathematical theory behind it. The influence of some of the many hyperparameters in the RNN are shown and the ease of Tensorboard is demonstrated. Finally we will see if it was all worth the effort and if we are really able to predict Bitcoin rates based on Twitter sentiment. Programming techniques that are covered: Python, Tensorflow, Jupyter Notebook, Tensorboard, Plotly and very briefly ElasticSearch in Python. Mathematical techniques are Neural Networks, activation functions such as sigmoid, softmax cross entropy, tanh functions, matrix calculation, cost functions and optimizers. 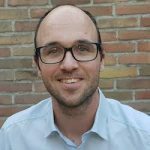 Bio: In June 2018, Olaf founded Data Science and Data Engineering company, specializing in machine learning methods. Previously, he studied Mathematics at the Radboud University Nijmegen and graduated in Financial Mathematics. At the onset, Olaf was mostly interested in (applied) stochastic models, and a few years after he graduated, studied logistic regression models and neural networks. He is especially excited about the power that you can describe complex models with lots of mathematics behind them in sometimes just a few lines of code.